Cycling affords it’s World Champions a real honour. To wear the famous rainbow stripes, making the rider instantly recognisable amongst even the most colourful of pelotons. 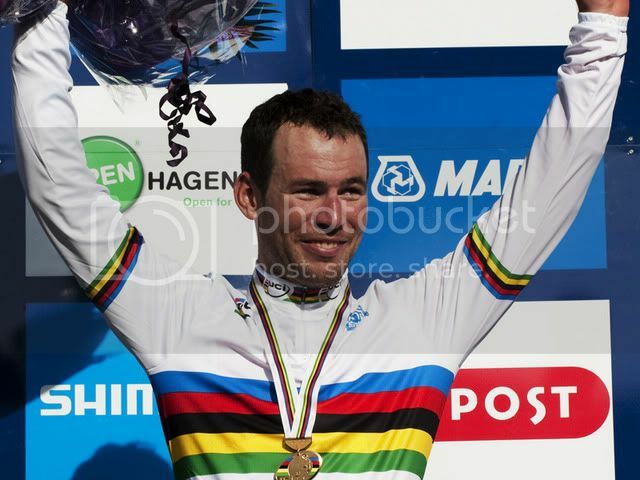 When Cav crossed the line first in Copenhagen last September he became the first British World Champion on the road since Tom Simpson in 1965. 2011 finished with even more plaudits culminating in him sweeping all before him as he was voted the BBC Sports Personality of the Year. One’s things for sure, with Cav you certainly get personality! With HTC-Highroad folding, the switch to Team Sky was a done deal, and he lined up for the 2012 season on the British super team. To the credit of Team Sky, they’ve been responsible for one of the finest examples of the World Campions jersey in many a tear. Simple, uncluttered, and when matched to black shorts, just about perfect! The year’s seen ups and downs in more ways than one. He’s won stages in almost all the races he’s entered, and he’s also hit the deck a fair few times in spectacular fashion. A record 4th straight win in cycling’s most famous gallop up the Champs-Elysees was probably the highlight, although the main target eluded him, as TeamGB took their eyes off the ball in the Olympic Road Race. All in all though, it’s been a great year in the stripes for Cav, he’s worn them with pride, and shown us all what a great champion he is. Chapeau!